KYLE VEGTER is a composer, producer, sound designer, and Managing Artistic Director of Manual Cinema. As a composer of concert music, he’s been commissioned by such groups as the Chicago Symphony Orchestra’s MusicNOW series, Pacific Northwest Ballet, and TIGUE. His music and sound design for theatre and film has been performed worldwide and commissioned by the New York Times, NPR’s Invisibilia, Topic (First Look Media), the Museum of Contemporary Art Chicago, StoryCorps, the Art Institute of Chicago, the Poetry Foundation, Hubbard Street Dance, the O, Miami Poetry Festival, and others. 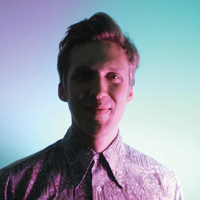 His past Composer/Sound Designer credits with Manual Cinema include Lula del Ray, Ada/Ava, FJORDS, Mementos Mori, The End of TV, and various other performance and video projects. He has been an artist in residence at High Concept Laboratories and co-founded Chicago’s only contemporary classical music cassette label Parlour Tapes+.